Every game needs the right props to set the mood and tell the story. Necro’s Bone Box contains high quality meshes scanned from real bones using photogrammetric techniques. There are two variety of cow skull, a nilgai antelope skull, a deer skull with magnificent rack, a ram skull, and a human skull. Also included are a cow pelvic bone and a leg bone. These bones are versatile! Necro’s Bone Box is perfect for adding a macabre tone to your horror game. Every western needs a cow skull! 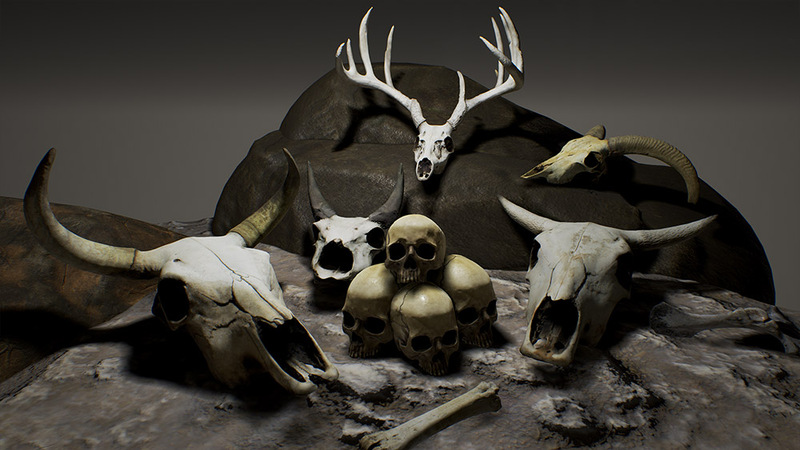 That bear cave you’re working on wouldn’t be complete without a deer skull among the remains of its last meal. How will you know the antagonist of your game is a serial killer without a bunch of human skulls in his apartment? Each mesh uses a diffuse, normal, specular, and ambient occlusion texture. Each texture is 2048 x 2048.